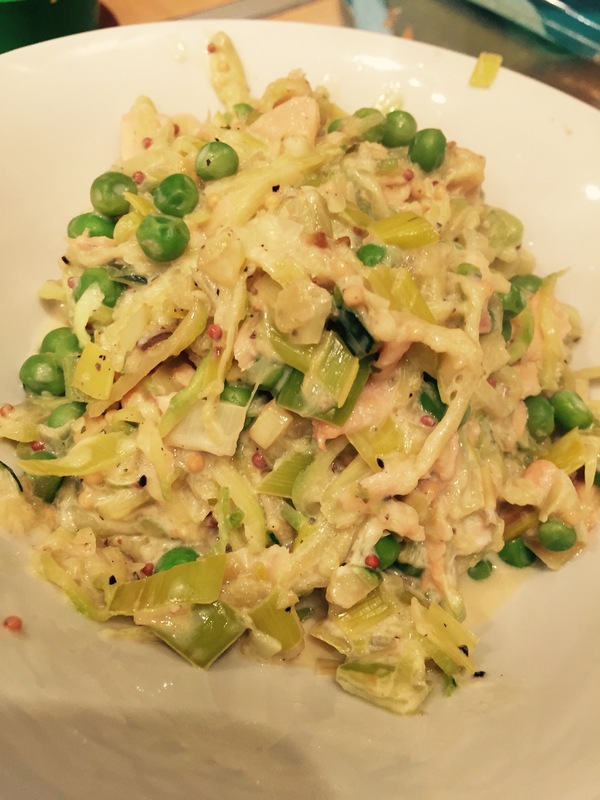 Zoodles – a how to my way! 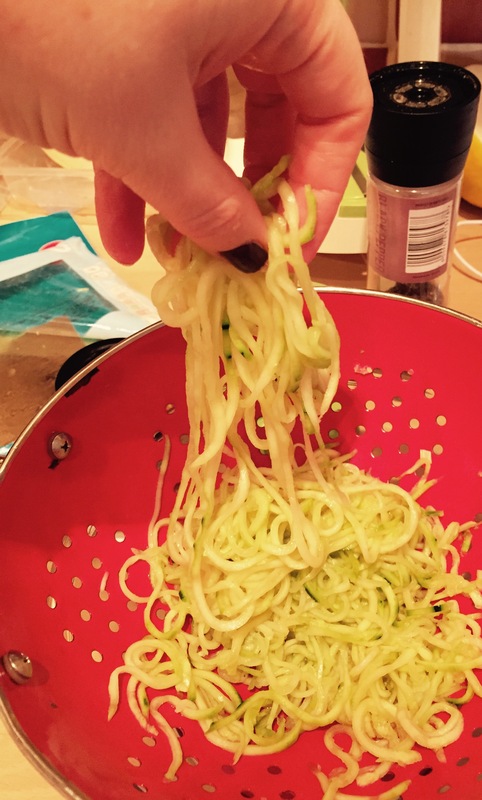 Here’s how I make “Zoodles” also know as courgette pasta or courgette noodles. Handy to have on an SP day if you are following Slimming World or as a low-carb option. 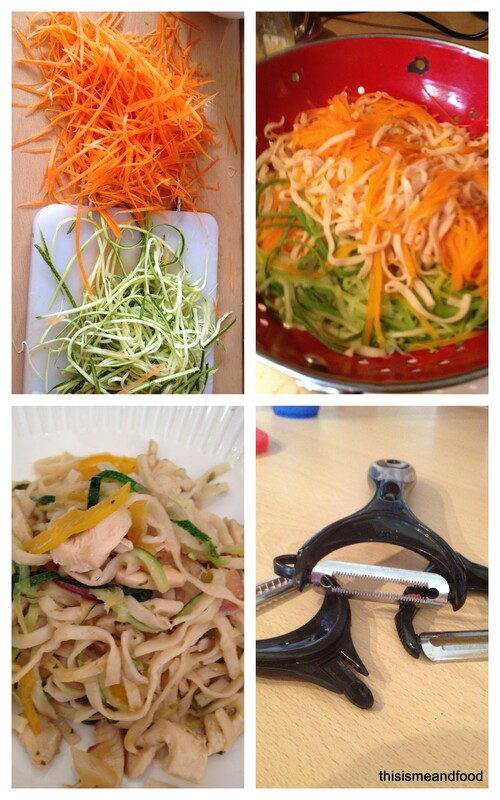 I have a spiralizer, they are easy to purchase on Amazon but if you don’t have one, just use a vegetable peeler and make ribbons of courgette and chop the centres left over finely to add to the sauce. Place the cut courgette noodles into a large bowl and sprinkle liberally with salt. Mix well with your hands then transfer all to a colander, placing the colander over the bowl. Leave for an hour for the excess water to drain off. Press the noodles down (but not too hard!) 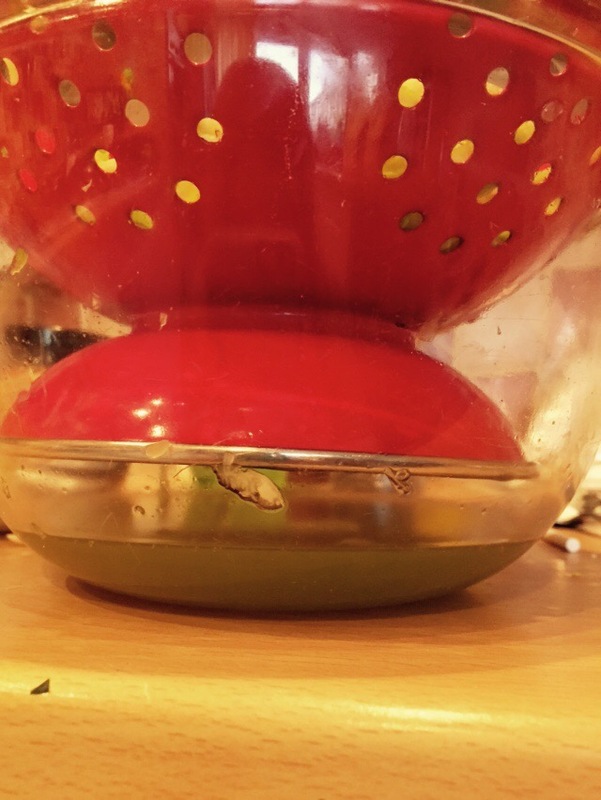 to squeeze out even more excess liquid and then toss them up to separate again. Spray a pan with lo cal oil or use oil of your choosing. If you are pressed for time skip the draining of liquid step and just add straight to the pan, you won’t need to add any water while cooking but they may be a little bit mushy when cooked! Great if you need “SP” day inspiration. I will make again using smokey bacon and eggs for “carbonara” on an SP day. I have a spiralizer, they are easy to purchase on Amazon but if you don’t have one, use a vegetable peeler to peel ribbon-like strips. Move over inner Nigella, I’m channeling my inner Jamie lately with my new favourite kitchen utensil – a 3 in 1 peeler!! 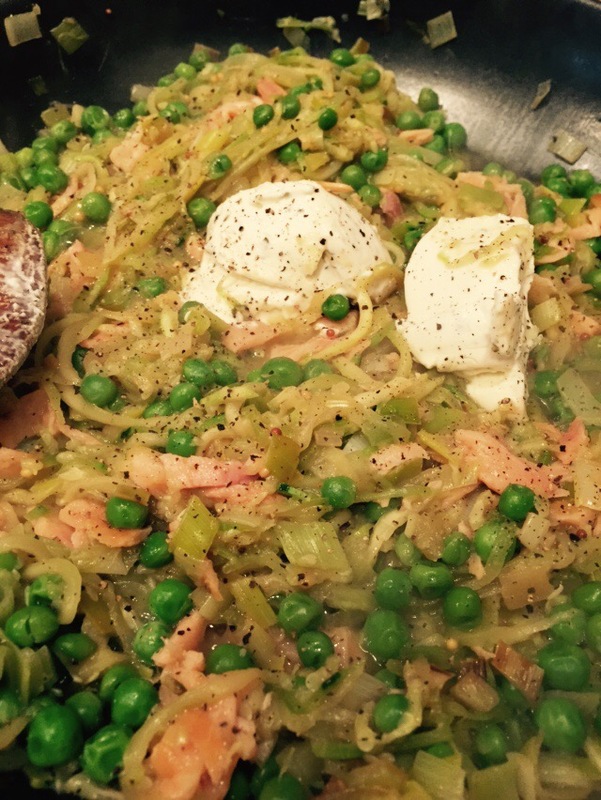 A long time ago, when I attempted lo-carbing for a while, I got to like “Zoodles” aka, courgette (Zukini) “noodles” – courgette sliced in very thin, julienne strips and used as a pasta substitute. Very nice, but a lot of work! A friend mentioned recently that she had purchased a Julienne Peeler and a quick google later I found this. I checked it out on Jamie’s Site and 5 minutes later had clicked “Buy”, my new toy arrived 2 days later! The first dinner I made using my new peeler was a Chicken and Noodle Dish, First I peeled the carrot using the regular peeler attachment, then popped that out and used the Julienne Peeler attachment to peel the carrot into Julienne slices. They will come off the vegetable in one strip and then you just lift them apart in a big bundle after, really easy and kind of fun! Watch your fingers though, I cut myself twice by holding the carrot awkwardly! Same for the courgette/zukini, but I didn’t peel it. I put the carrot strips into boiling water for 2 minutes, then added wholewheat noodles, cooked them for 3 minutes, then added the courgette and simmered for another minute. Drained all and kept to one side. I stir fried chicken pieces, onion and pepper with some chilli, lemongrass, garlic and ginger, added the noodles and veg and splashed in some oyster sauce (1 syn per tablespoon) at the end. I am subscribed to an excellent blog, i’ve mentioned it before – Slimming Eats and this morning opened my email account to find an email with this Bruschetta recipe. Perfect idea for breakfast! I had some over-ripe vine tomatoes in the fridge, and wanted to try the “soft fruit” attachment of the new peeler! 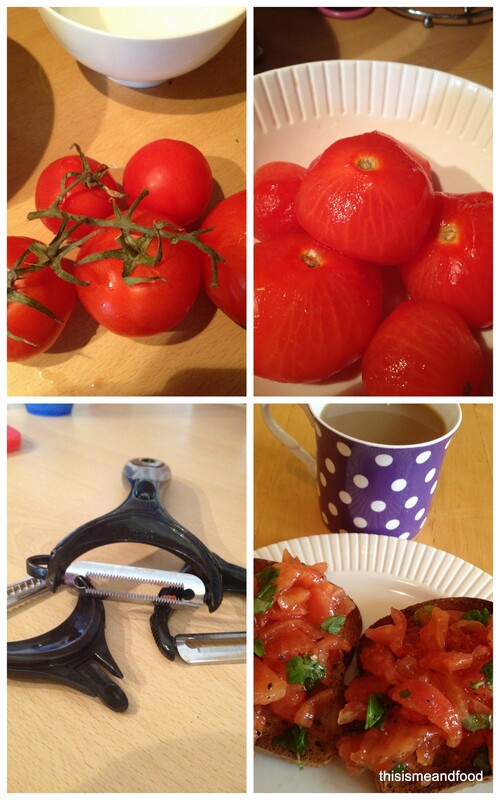 Well, no more boiling and skinning tomatoes for me, the peeler works like a charm and so easy! Feeling lazy, I just toasted some wholewheat bread (60g, Healthy B) and decided that I didn’t fancy garlic first thing in the morning. So while the bread was toasting, I de-seeded and chopped the tomatoes, added some fresh basil and extra virgin olive oil. As per recipe, I served the tomato mix on the toast and it was delish!! Will be even nicer made correctly as a starter.